I love a masculine looking quilt. It's not easy finding quilting fabric that doesn't have flowers or bright girly colors. That's why I adore carolyn friedlander's fabrics. This line is called architextures. It came out several years ago, and I went on a hunt. You will also find some "sphere" by brigitte heitland for Zen Chic. I've just started using this 80/20 comfort blend batting (see stats). The 20 poly gives the quilting a nice lift. Though I never thought I'd use anything polyester, I think I like it. backed with flannel for the winter . . . so cozy!! By the time I had finished the top, I had a nice collection of these triangles left over for the back which I played around with until I came up with this flying geese design. I try to work on the idea of the back with left overs from the front WHILE I'm sewing the front, otherwise, I'm too lazy to put something together if I've waited till the end to create the back. (wow, I think my English teacher would call that a run-on sentence). Great quilt! I agree it's hard to find great looking prints that don't scream "girly", and Carolyn Friedlander nails it. I really like what you have done with this quilt. 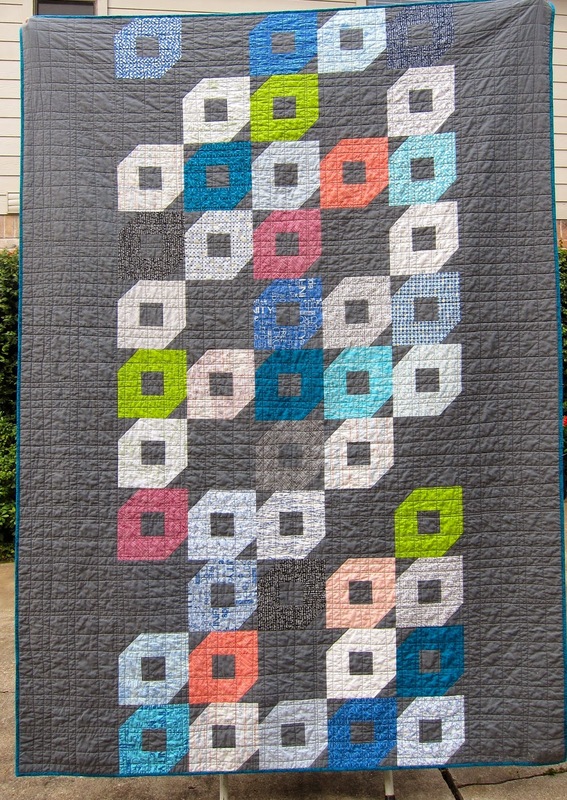 the layout is wonderful and unusual and the quilting seems to give it the perfect texture. What a lovely quilt! 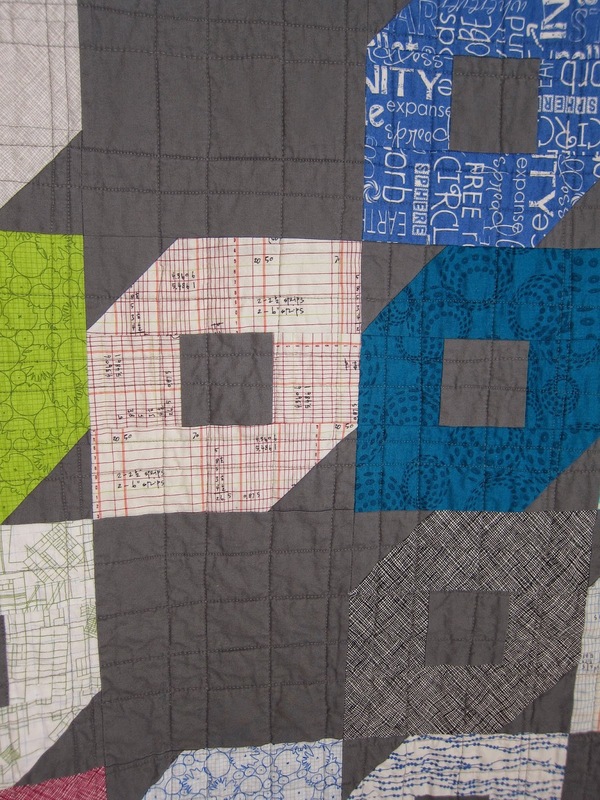 I really love the fabric with the sums - not that I can add up myself! The blue binding you added pulls it together beautifully, it's a great touch. A great manly quilt. 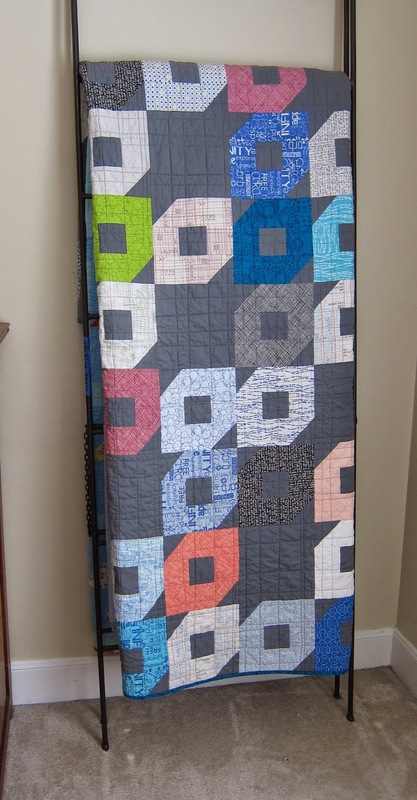 I love that it almost looks 3-D.
What a great guy quilt. I really like the addition of the flying geese on the back. That is a great guy quilt! I love your pieced backing! Oh what a great quilt - and I love the flying geese on the back. It's a nice masculine quilt but without shouting "I am a boy quilt and I shall be all blue" !! Your backing is wonderful! That's my least favorite part of quilting, so I tend to just get the fabric sewn together just to get it over with. 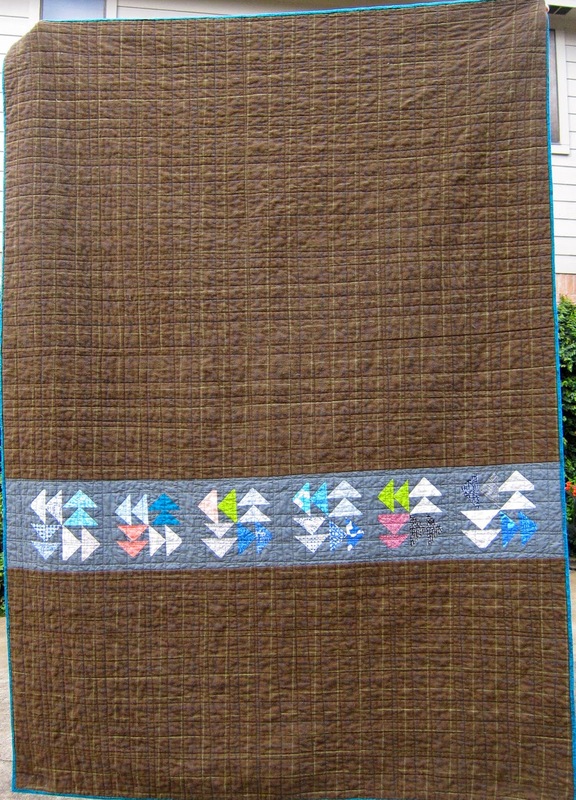 This is a great "guy" quilt. Love this quilt. So masculine as you say. My hubby would love it. I really like the poly batting. It gives the fabric a lift, the quilt some dimension and it is light and warmer that the cotton battings. I never thought I would use poly batting - but I am in the baby quilt making biz and that is all Mom's want now because it is so much softer and lighter to lay over a baby or toddler. Love the color placement in this! Although I have a BIG box of cotton batting to work through, I too am intrigued by the extra puffiness that a little poly brings to a quilt. I will have to give it a try! Beautiful quilt!